Science Camp is another way we focus on a child's spiritual education at Illumine. This five-day camp is a little like the Vacation Bible School you may be familiar with, combined with fun and engaging Science topics kids love. Science Camp teaches kids of all ages using a combination of games, crafts, lessons, music, and collaboration. 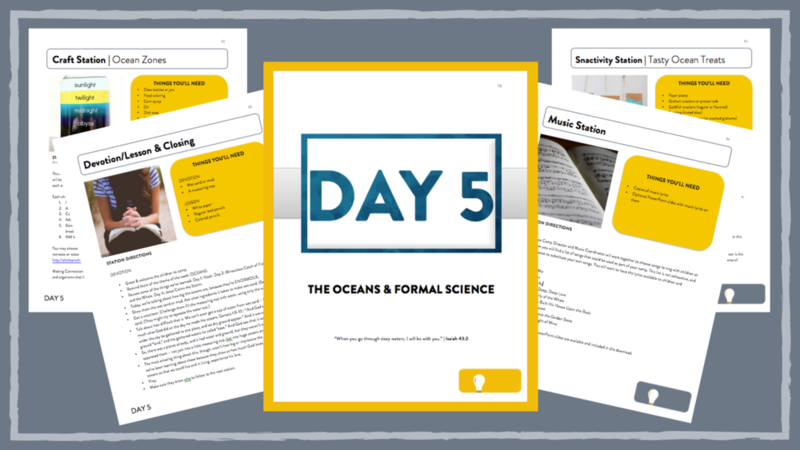 This valuable resource will help you run your own successful five-day Science Camp event, and in doing so you will be able to help kids in your community understand that God is the god of all things, including science. We’ve created this resource because we believe that when kids are able to connect science and religion, both areas of thought will make more sense. Thank you for investing in the spiritual and intellectual foundation of future leaders in Christ’s church. over 300 pages of Valuable resources! The comprehensive, 92-page Science Camp Guide includes everything you will need to host your own Science Camp for children. Information on scheduling, volunteer job descriptions, recruiting ideas, publicity information, step-by-step planning calendar, master supply list, opening activity games and coloring sheets, and station lesson plans for five days worth of activities are all included in this download. Make it simple for families to sign their children up for Science Camp. Just print and display the sign-up sheet. These colorful Science Camp invitations are easy to edit and print two-sided. More than just first and last name, the registration form gives you ideas on the type of information you may want to collect when registering families for Science Camp. Publicity matters when it comes to hosting a successful Science Camp. There are 14 images provided in this download for you to use in whatever way you choose. When families arrive with their children, the coloring pages can be made available for children to work on when the adults check in. Individual station plans can be printed for volunteers before the camp so they can be familiar with activities before each day of camp begins. These plans also include the station supply list, which is very helpful when setting up the stations. The themed journal gives students a place to record their thoughts for the activities from each day. The journals are structured enough to provide organization, but open enough for all students to be successful. From customized sign-in sheets to name tags to themed completion certificates, you will find everything you need to make your Science Camp successful.